The New York Times bestselling author of The Stone Monkey is back with a brilliant thriller that pits forensic criminologist Lincoln Rhyme and his partner Amelia Sachs against an unstoppable killer with one final, horrific trick up his sleve. The Los Angeles Times calls his novels 'thrill rides between covers,' The New York Times hails them 'dazzling,' and The Times of London crowns him 'the best psychological thriller writer around.' 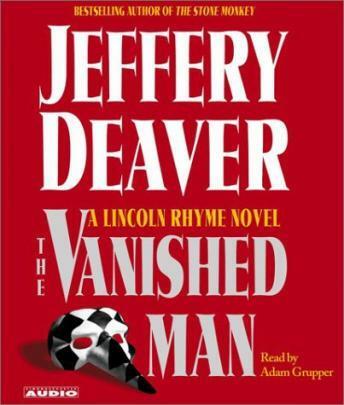 Jeffery Deaver, America's 'master of ticking-bomb suspense' (People), delivers his most electrifying audiobook yet. It begins at the prestigious music school in New York City. A killer flees the scene of a homicide and locks himself in a classroom. Within minutes, the police have him surrounded. When the scream rings out, followed by a gunshot, they break down the door. The room is empty. Lincoln Rhyme and Amelia Sachs are brought in to help with the high-profile investigation. For the ambitious Sachs, solving the case could earn her a promotion. For the quadriplegic Rhyme, it means relying on his protéegéee to ferret out the master illusionist they've dubbed 'the conjurer' who baits them with gruesome murders that become more diabolical with each fresh crime. As the fatalities rise and the minutes tick down, Rhyme and Sachs must move beyond the smoke and mirrors to preven a terrifying act of vengeance that could become the greatest vanishing act of all. A lot of interesting twists and turns. I wish there had been a little more background information on the storyline before all the mayhem started. I did not really enjoy this book - perhaps because it was abridged. Due to the quickness, every major chapter was a jump and perhaps in the full book the concept/text better develops how they got there. I loved this book. I like the Lincoln Rymes series. This one was unique with its slant towards magic. It had so many twists and turns you were always surprised at what would happen next. My husband liked it alot as well. I found this book silly and predictable, I am glad I got the abridged version or I would have never finished it. Another great Lincoln Rhyme story. A few twists that kept me guessing.I really like this author. Very good read. Not up to par with Bone Collector, but it contains nice plot twists that keep you guessing. Interesting story and it kept me reading. Not as good as Bone Collector. Just Right. This was a fun thriller with lots of twists and turns, but easy to follow. I love these books that you hate to have end.